Join us for a drink and an authentic western saloon experience at the Apartment Bar located in the Main House at Eatons’ Ranch. Choose from a selection of call and premium liquors or have a glass of one of several of our house wines. The Apartment Bar also features Sheridan, Wyoming’s local Blacktooth Brewery beer on tap. This charming western saloon is open from 4:00pm to 10:00pm each day for our guests during the dude ranch season. The Apartment Bar is also open during the Bed & Breakfast season as well. Hours for the winter season are 5:00pm to 10:00pm Friday and Saturday. 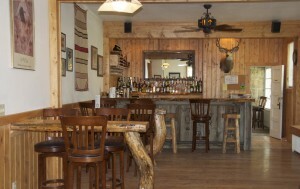 The bar also opens on Sunday mornings for a western saloon style brunch from 10:00am until 2:00pm.